Candy rings made from real Candy! 4 DIFFERENT CANDY RINGS AVAILABLE! • Mega Glitter Big Candy Heart Ring - LOTS of gorgeous glitter on a large candy heart. 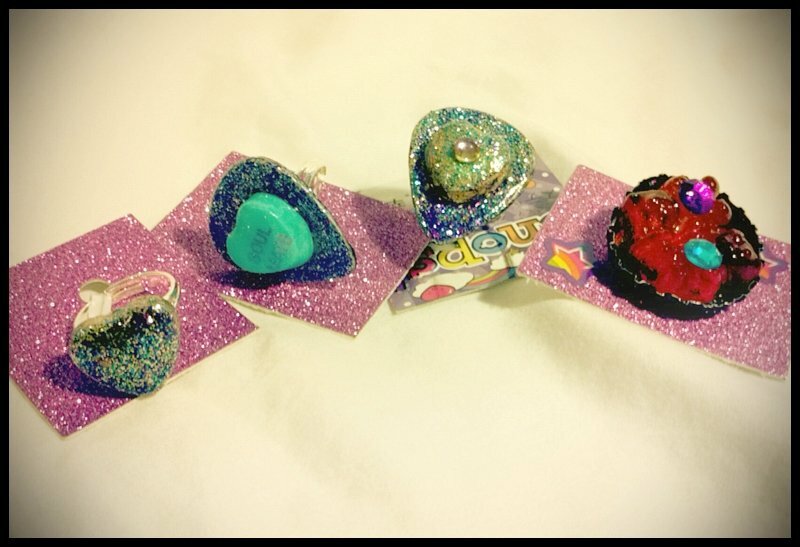 • Blue Guitar Pick Ring with Blue Candy Heart "SOUL MATE" Ring - Blue and Silver glitter. • Glitter Candy Heart Guitar Pick Ring - multiple colors of glitter topped with an iridescent gem. • Gummy Bear Bottle Cap Pin - Red and Orange gummy bears with gems and glitter.